I’m a bit late with this one, so this is just a quick post to get caught back up. I really enjoyed this cake. The texture is similar to pound cake. The flavor is simple and delicious, just perfect with your favorite cup of tea. As the recipe suggests, the flavor develops with aging. It was very simple to put together, the only part that required a bit of extra attention was browning the butter. You need to watch it closely so that the end result is “browned butter” not “black butter”. I used vanilla instead of the vanilla bean, but otherwise followed the recipe exactly. I think I will have to make this again when strawberry season arrives. It would be a fabulous cake for strawberry shortcake. 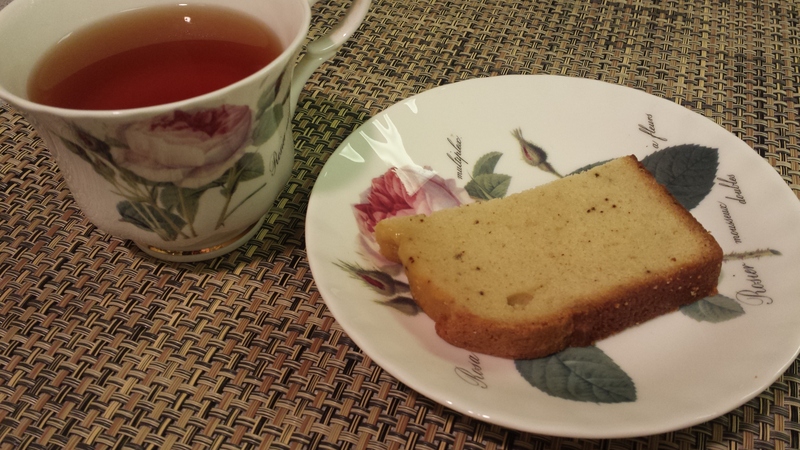 This entry was posted in Baking, Baking Chez Moi, Cake, Tuesdays with Dorie, Uncategorized. Bookmark the permalink. I really need to make this again with the vanilla bean; just love the flecks that show in the slices. Did you know, there is such a thing as “black butter”? One of the other bloggers, Alvarosa, mentioned it. Never heard of it myself. YES – this would be great for a shortcake-type dessert! Love your china set! Oh, I agree – this cake would be perfect with strawberries! Glad you got to it. It’s got such wonderful flavour.